The Apple notebook that people love now has the commercial that people love too. Apple’s new spot shows a laptop running the gauntlet of sticker customization. 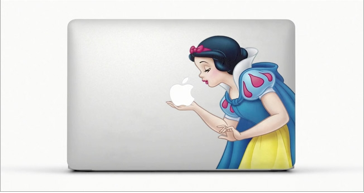 The apple on the laptop is getting kissed by Snow White, eaten by Homer Simpson and getting shot by a bullet. I’d be lying if I said I could resist its charm myself because it’s just so damn cool; all those decals set to that dance music. . .it’s just electric. Apple has this strange marketing power that’s somehow trendy and timeless, sleek but not slimy. Some of the laptops featured in the ad aren’t even in out of the box condition. Take this Looney Tunes shot. Apple is so confident you’ll fall head over heels in love, they go au naturale. I’m even willing to forgive the fact that the ad was pretty much ripped off from the Google Play ad a while back that had a similar play on its logo. What’s genius without a little inspiration? I think it’s pretty safe to say that the marketing machine at Apple isn’t going to endanger the brand anytime soon but the new Stickers spot has created something of a boom for the decal makers. Since the release of the ad, sales of vinyl stickers have spiked to up to four times the amount a couple months ago. Can Apple do no wrong? By the way, the Stickers ad doesn’t even show a laptop screen. Not once. Does Apple do anything wrong? !